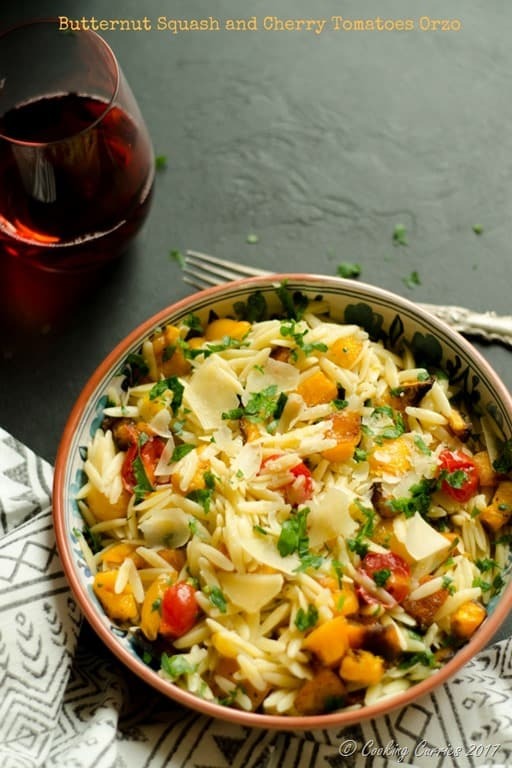 A summer meet fall kinda pasta dish with cherry tomatoes and roasted butternut squash with a squeeze of lemon and a sprinkle of parmesan! 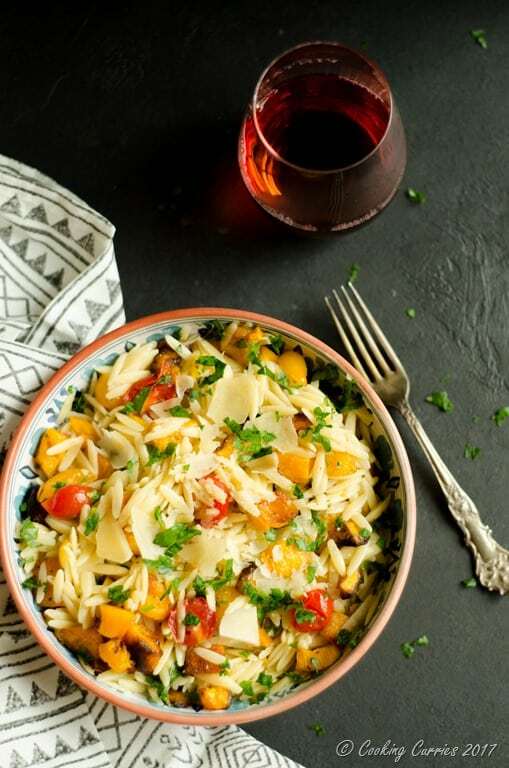 With summer’s bounty of cherry tomatoes and fall harvest of butternut squash, this orzo dish is the perfect combo of summer and fall. Just like where we are right now in September. It is not the peak of summer and the evenings have a chill to the air and its not quite fall yet. Quick and easy weeknight dinners are always what I am looking for. Something easy to put together with not a whole lot of ingredients but something that is packed with flavor and is filling at the same time. Pasta dishes fall into this category most of the time. 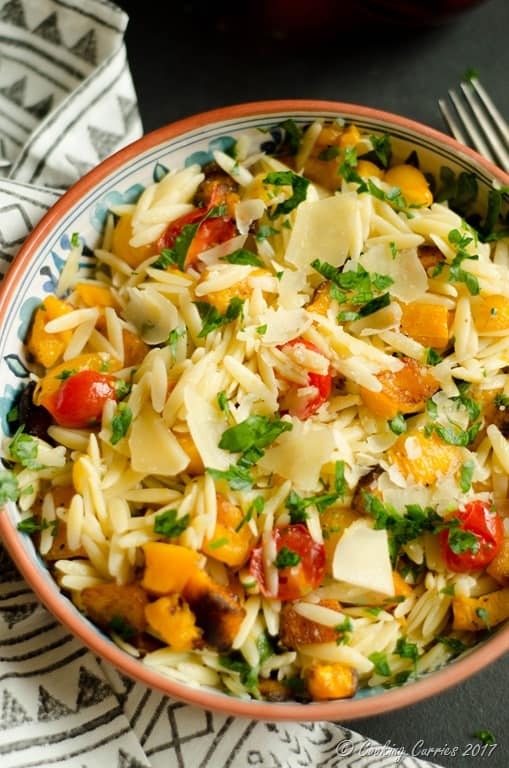 I love roasting butternut squash and I had some cherry tomatoes in hand too, so I thought, why not combine the two in a simple pasta dish with just a squeeze of lemon and a sprinkle of parmesan and some fresh parsley to seal the deal. The flavors combo worked so well and that lime gave the right amount of freshness to it, that I just kept eating from the bowl that I made it and kept for us to eat for dinner. Yeah, sometimes I am like that in the kitchen. If I really really love what I made, I make a small bowl of it to myself, while I’m still finishing up other things in the kitchen, to snack on. The cook does deserve that much, right? Preheat the oven to 400F and toss together the butternut squash, salt, pepper, 1 tbsp olive oil and paprika in a sheet pan. Bake for about 20-30 mins, till the squash is roasted. Meanwhile, boil salted water in a sauce pan and cook the orzo in it to al dente. Reserve a cup of the pasta water. Drain the orzo and keep aside. Cut the cherry tomatoes in half and keep aside. Heat the remaining 1 tbsp olive oil in a pan and add the minced garlic and cherry tomatoes to it. Toss quickly for a couple of minutes till the tomatoes soften a little. 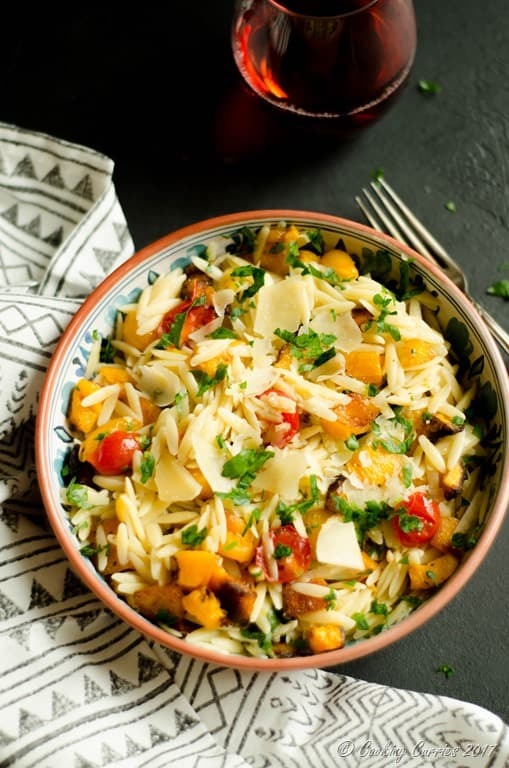 Transfer the orzo to a large serving bowl. 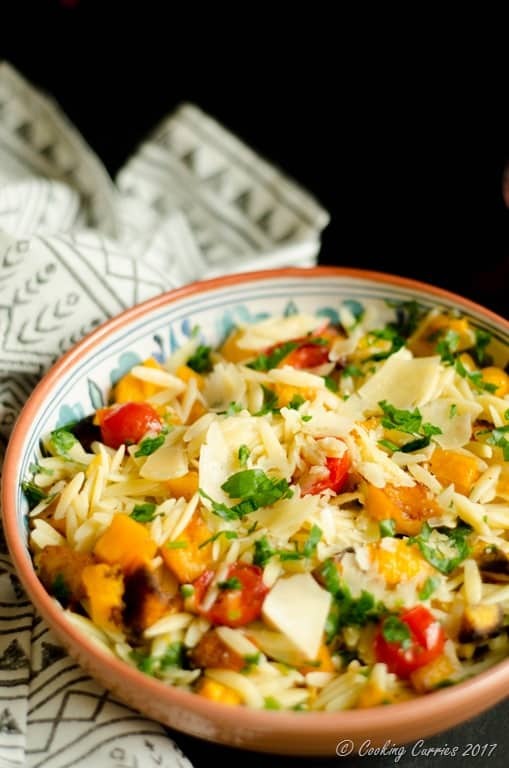 Add the roasted butternut squash, cherry tomatoes, walnuts, lemon zest and juice, more salt and freshly crushed black pepper, about 1/2 cup of the pasta water, parmesan and the parsley. Toss well and seve warm.